I am a member of online affiliate programs. I may receive compensation for purchases made through links in this post. All opinions are my own and I only recommend things I truly use and love! I just finished my month long pantry challenge!! If you’re not aware of the term, a pantry challenge is meant to encourage you to use up items you already have in your home, (pantry, fridge, freezer, shelves, etc. ), instead of spending money at the store on groceries. My goal was to save a little extra money during the month by spending less on groceries. To do this I decided to cut my regular grocery budget of $400 a month in half. This would mean I could only spend $200 for our family of five. This was no easy task and I was incredibly intimidated from the beginning, but I was determined to make it work. The pantry challenge is now officially over (thank goodness) and I am proud of how the challenge went. I would LOVE to say that I was able to only spend $200 on groceries….but I didn’t quite accomplish that. I went over budget by $1.98. I spent $201.98 on groceries for our family of five….and you know what I am so PROUD of MYSELF!!! I wanted to share all about how I was able to make it work and what I learned during the process. The ONLY way I could be successful with this pantry challenge was to plan ahead. I’ve always been a meal planner, but I learned quickly I needed to be much more detailed about planning every snack and meal. At the beginning of each week I looked through my pantry, made an inventory of all our food. I wrote down the meals and snacks we could make with what we ALREADY had in the house. I was able to eat out of the pantry exclusively about 50% of the time. The other 50% of the meals I tried to only plan really frugal meals with only a few cheap ingredients I would need to buy. 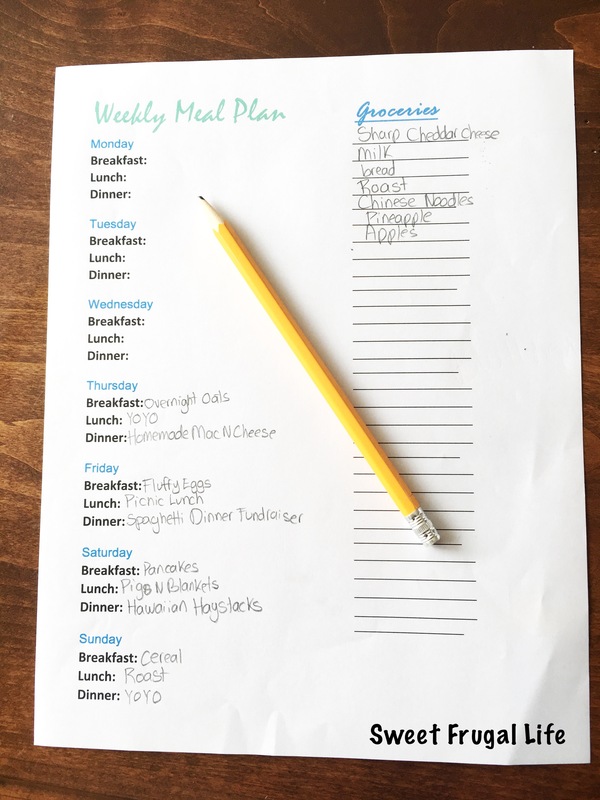 This meal planner that I use is available as a Free Printable in my Free Frugal Living Challenge. I listed out a few of the meals and snacks I found to be the most helpful in keeping the grocery costs low. A few of these recipes (starred) are also available for free in my Frugal Living Challenge. I am a little obsessed with grocery shopping using Walmart Grocery Pickup (hello, shopping in my PJs and groceries loaded in the car FOR ME! Sign me up!). With my $200 monthly grocery budget, I was only allowed $50 a week. One of my favorite things about Walmart Grocery Pickup is the ability to watch my cart total while I’m shopping. (I know I COULD use a calculator at the store, but I’m just not great at it….) Being able to see how much I’m spending WHILE I’m shopping was crucial for me during this challenge. If my cart ever went over the $50 amount I knew I needed to go back through the cart and delete a few items. This was MUCH harder to do than I had anticipated! My family all had to sacrifice a few items we were use to having regularly in order to make the month work. I would LOVE to tell you that my family was totally on board and excited about my little July Pantry Challenge Experiment……but, they didn’t really love the idea. When they saw the amount of food I was bringing home with each grocery trip they started complaining about the lack of food. I tried to get my kids excited about the goal and had them help me make a lot of our homemade snacks. They liked being able to help and were somewhat excited at the thought of having a challenge. Unfortunately, this only lasted a couple of weeks. As the month went on they began to get a really tired of the challenge. The biggest problem was the snacks. They are use to having snacks in the pantry, and we just couldn’t have those this month. 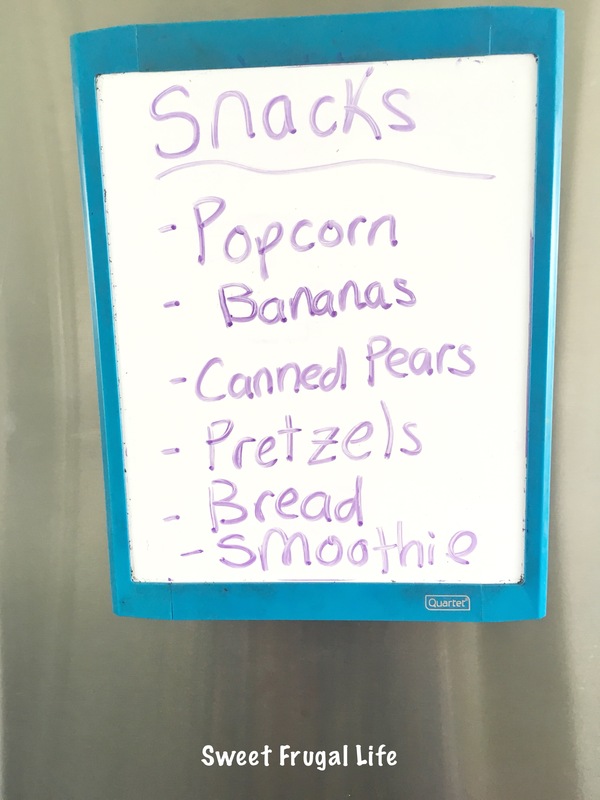 I decided to make a list of snacks we did have available and I hung it on the fridge. This helped them a lot! I think they had gotten so use to those convenience snacks (not awesome parenting, I know) that they had forgotten about all the other great options we had. Even though my family didn’t necessarily ENJOY the pantry challenge, I am really glad they were able to go through it with me. It was such a good life lesson for my kids to learn about stretching dollars and how much food really costs. My biggest takeaway from the July Pantry Challenge is that I CAN live on less than I usually do. Yes, it took A LOT more effort, (preparing a lot more food from scratch and a lot of time planning), but I CAN do it! We survived. Moving forward I have a new sense of motivation to stay in budget, shop my pantry, and really spend with a purpose. I’ve always told myself the lie that I HAVE to spend money on this food because we NEED it……but, we don’t! We were just fine having less food around. I am excited to take this new knowledge and adjust my grocery shopping from here on out. My pantry challenge is over! Does this mean I get to spend a lot of money next month restocking my shelves????? Absolutely NOT! I will be going back to my regular grocery budget of $400 a month. I will slowly try to restock my pantry, but I will always stay within that $400 budget. I honestly was terrified for this challenge! I really didn’t know if I would be able to meet my goal, $400 a month is usually a little bit of a challenge. But I did it, and I’m so glad I was willing to try! 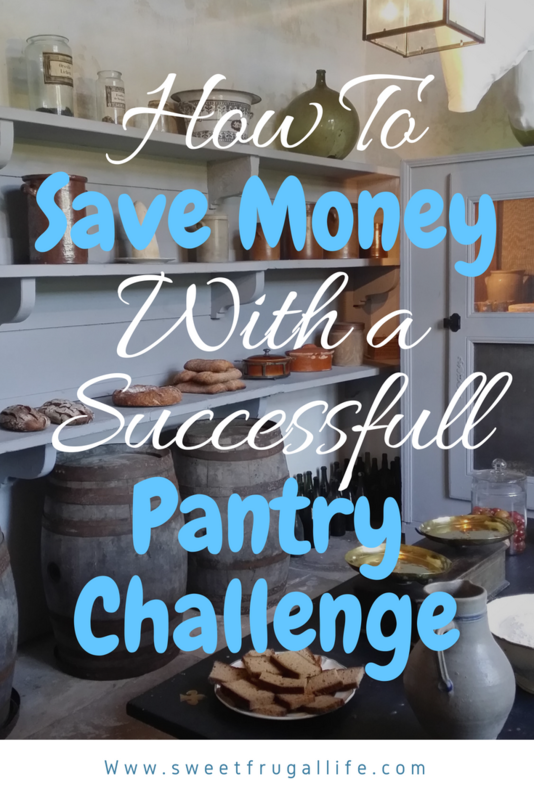 If you are wanting to find a way to save a little extra cash, try having your own personal Pantry Challenge. Be sure to come back and let me know if you did it and how it went!! Great job. Going $1.98 over budget isn’t so bad! I mean, that’s pretty darn close, so I would call that a win. We also did a pantry challenge in July and it really opened our eyes as to how much food we had in the house. I would say we cut our grocery bill nearly in half for the month and we will be continuing to focus on what we have first, and grocery shopping for the essentials after that. I agree that snacks were the hardest part for us as well, and that was only with one kid. But hubby takes a number of snacks to work with him, so we got creative and made it work. Good job on your own Pantry Challenge and for the fact that you are going to keep going!! / minna all the way from Sweden?